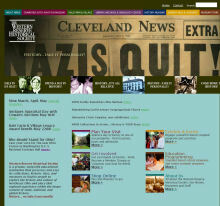 My web searches for materials on Cleveland Jewish History often lead to websites on other facets of Cleveland history. Here are links to some of those sites. Your suggestions for local history links are welcome. Contact page. (Last updated September 1, 2015) In alpha sequence. A cyber-museum for one of Cleveland's first "inner-ring" suburbs. Though the society has no physical home, its attractive, deep and rich website offers images and history by many authors. Their pages show a concern for the city now and in the future. Its Links page is a must-see. The site now includes the archives of Coventry Neighbors, Inc. Kudos to Chris Roy and Lisa McCampbell, both volunteers, for their good work. The CSU website went online in May 2011. It is a collection of web stories that should appeal to a broad viewing public. It says it is a mobile application: use your smart phone to find nearby sites of historical interest. But it is also great for home use on a large screen. Its pages balance rare and well-captioned images with lively, well-written text, plus audio and video. Easily navigated. 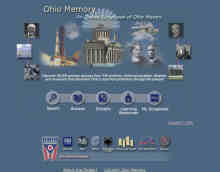 Complements CSU's other history sites which help to share huge collections of digital resources. 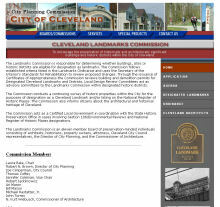 The Cleveland Landmarks Commission encourages the preservation of historically significant buildings and historic districts within the City of Cleveland. Its website has a large collection of images of city landmarks, from the Erie Street Cemetery to the Jerry (Superman) Siegel house. 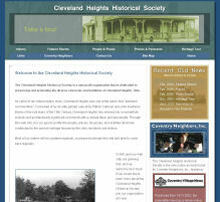 Part of the rich website of Cleveland's City Planning Commission. Wish the website included historic buildings lost to us. A showcase for the Special Collections of the Cleveland State University Library. Nearly 25,000 objects and growing. Can be browsed or searched. Rich collections of ethnic materials. Includes the story of the Hebrew Cultural Garden. 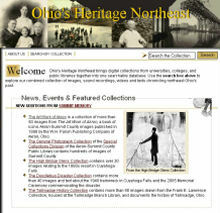 Same search engine as Ohio's Heritage Northeast, but accesses fewer collections. Its eBooks include Beachwood by Jeffrey Morris and early histories of the city. Now includes This Tempting Freedom by Allan Peskin, the only professionally researched history of Cleveland's first Jews. 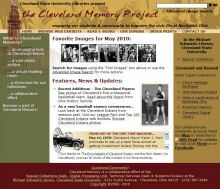 Has the most complete list of Cleveland history resources on the web. Back when Cleveland was our nation's fifth largest city, we had one of its finest city libraries. CPL has somehow managed to remain a community treasure. Specially useful are its online research tools, an astounding map collection (well worth a real visit to the Stokes Building downtown) and a huge searchable online image collection. Also helpful is their checklist for property research. New (as of 11/2010) is a searchable archive of the Plain Dealer, back to 1845 on their Research Databases page. Their online City Directories are useful. The 1906-07 issue may be specially useful as it has the old and new addresses. 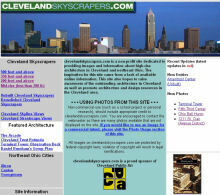 A non-profit site dedicated to providing images and information about high-rise architecture in Cleveland and northeast Ohio, created and maintained since 1998 by graphic designer Shawn Hoefler. His inspiration came from a lack of available online information. This site aims to raise awareness of the outstanding architecture in Cleveland and promote architecture and design resources in our area. Starting in 1996, this voluntary group built a site about Oberlin Ohio and its history, developing materials that could be used in teaching history in the public schools. 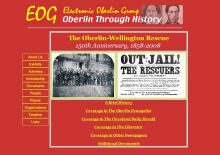 Many of the site's topics were developed by Oberlin College students. Though the EOG ended in 2003, new materials can still be submitted to the website. 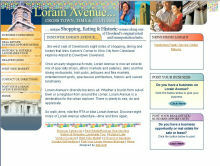 To travel west the eight miles on Lorain Avenue, from Ohio City and the West Side Market, to near the airport, is to travel part of Cleveland's history. This beautiful site has virtual tours of seven neighborhoods, from the West Side Market district to Kamm's Corners at the border of Lakewood. Includes a list of businesses, posted by the establishments. Hosted by Cleveland State University's Library, this website brings together digital collections - images, sound recordings, videos and texts - from colleges, universities and public libraries to help chronicle Northeast Ohio's past. 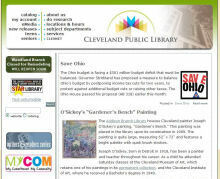 Includes many Cleveland collections such as the Public Library and Cleveland Press. Image search tools are strong, but browsing or moving ahead image-by-image is not possible. The Ohio Historical Society's website says "Discover 26,000 primary sources from 330 archives, historical societies, libraries and museums that document Ohio's past from prehistory through the present. Formed in 1947, the Shaker Historical Society and Museum is at 16740 South Park Boulevard, east of Lee Road, in Shaker Heights. Under new leadership since 2010, the Society and its website have become much better, livelier places to visit. 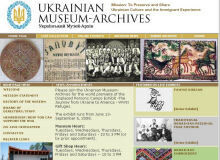 Located in Cleveland's Tremont area, with a mission "To Preserve and Share Ukrainian Culture and the Immigrant Experience", this crisp, attractive, easily navigated website is a pleasure to visit. 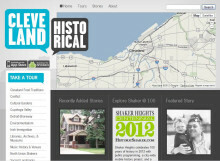 You'll see more in their online exhibits than you will in the websites of Cleveland's oldest and best-endowed museums. "The Library of the Western Reserve Historical Society is the largest American history research center in northern Ohio. Its holdings consist of 238,000 books; 25,000 volumes of newspapers; 30,500 rolls of microfilm, 4,000,000 prints and photographs; and more than 3,700 collections of manuscripts and archives that comprise more than twenty million items." You can search their catalog online. Serious research will require time in their library, where a helpful staff is available. Includes the Cleveland Jewish Archives.